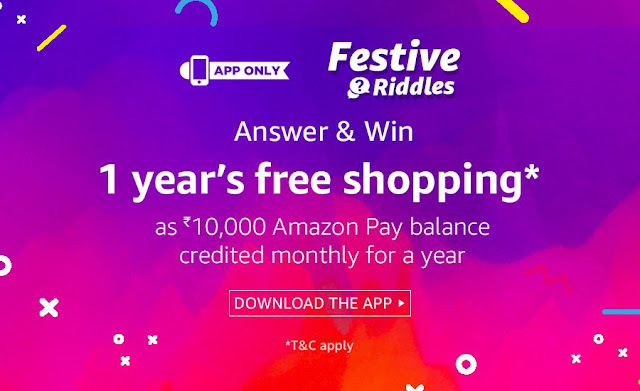 Hey Guys Amazon Keep surprising us with daily amazon quiz where you win lots of free Products .Today we Provide ALL Answers Of AMAZON Festive Riddles Quiz to help you to win Free One year shopping on Amazon.So Keep Reading this Post to get Amazon daily Quiz answers here. Amazon India Organizing Treasure Hunt Quiz which is very popular these days and more Quizes to which keep app users busy to win some thing every day and Off course Great shopping deals to on Amazon also. Spread me like a carpet if you must. If you step on me though I’ll turn to dust. What am I? I have black and white teeth but am not a living thing. What am I? I am made of sugar & soda but you shouldn’t eat me. I hiss & slither but I cannot eat you. What am I? I have a head, a tail but no legs. I travel widely. What am I ? I am tall when I’m young. I’m short when I’m old. What am I? Round & round but never off the ground. Who am I? First of all Install and Open the app. Now simply Sign in in the app. 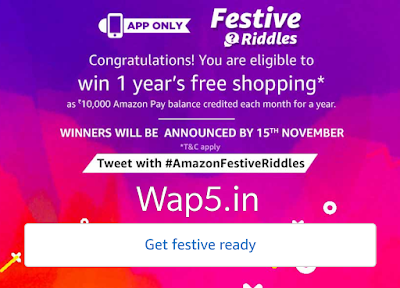 ON amazon app home screen You see Top Banner of Festive Quiz . Open this Quiz to see all detail. Now keep swiping Questions and start answering all 10 Questions. As you Give all answers you are eligible to Win festive quiz. There are a total of 1 (one) Prize(s) that will be given under this Contest. The Prize will be delivered to the winner on or before 30th December 2017. This Contest will commence on 27th September from 12:00:01 a.m. (IST) to 15th October 11:59:00 p.m. (IST) (“Contest Period”).